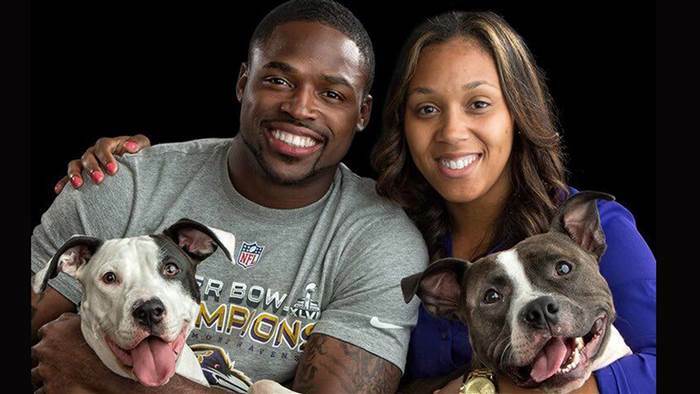 Torrey Smith, a wide receiver for the Philadelphia Eagles, just gave a major assist to a whole lot of shelter pets. This past weekend was the fifth annual Pawject Runway, an event put on by the Baltimore-based anti-animal cruelty campaign Show Your Soft Side. At Pawject Runway, guests mingle with the Softies — as well as adoptable cats and dogs from BARCS, Baltimore’s animal shelter — to raise money for the city’s homeless pets. Matt Judon, outside linebacker for the Baltimore Ravens, walks down the runway with an adoptable kitten at the 5th annual Pawject Runway. “When he announced that he and Chanel wanted to make this gift to ensure everyone had the opportunity to adopt an animal, and to be sure they all found good homes, the crowd went wild,” BARCS’ executive director Jennifer Brause said via a spokesperson. One of the lucky pups whose adoption fees were covered by Torrey Smith and his wife. Just about every cat and dog was spoken for by the time Pawject Runway came to a close — except for a little pup named Zappa. That is, until Baltimore Raven Ronnie Stanley, another Show Your Soft Side ambassador, came to BARCS early this week to put in an application. Ronnie Stanley, an offensive tackle for the Baltimore Ravens, with his newly adopted pup. Stanley tackled hearts the world over last spring, when he and his girlfriend walked into BARCS and asked to adopt a dog “that’s been here a long time.” They went home with Lola, a 6-year-old dog who’d had a rough start to life. Zappa, now named Rico, is another dog who didn’t have the easiest beginning. That’s all changed now. At the shelter on the day of his adoption, Rico gave his famous new dad “a million kisses,” per a BARCS Facebook post, and then rested his little head in Stanley’s big arms. Stanley later sent the shelter photos of Lola and Rocco smooching away. Baltimore Ravens tight end Maxx Williams with a dog in a tutu at Show Your Soft Side’s Pawject Runway. BARCS’ Brause agrees, and she is thrilled that folks like Smith and Stanley are publicly displaying such love for animals — especially shelter pets.